Soulrest is one of the eight-major cities in the province of Black Marsh, being situated along the eastern shores of the Topal Bay. Soulrest is found along the east coast of the Topal Bay, the large body of water that lies on the end of the Niben River. There is a river estuary found near Soulrest, which leads into the rest of the province and areas such as the Blackrose region. Like other waterways, there is a thicket of mangroves that cover it. 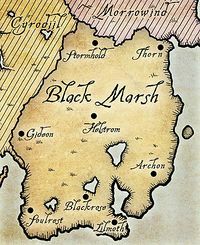 The southern coastal areas of Black Marsh, around Soulrest, was once the territory of the Lilmothiit. Soulrest is neighbored by several settlements, one of them being Chasepoint in the east. Soulrest has been an active settlement since 1E 1033. The Blackwater War in the late First Era had ravaged across Argonia, and so Soulrest was caught in the crossfire. The second campaign against Argonia was conducted by General Regulus Sardecus, ended in 1E 2828 with the Great Burn. Legate Elissia Mallicus had ordered her unit of sappers to burn a peat bog outside of Stormhold. However, this bog was connected to an underground network that stretches across Argonia. And so the entire region was set ablaze, with reports as far as Gideon and Soulrest. It took several months for the Imperial Legion to realize that Argonia was in fire. In the end, Soulrest was a city of the Second Empire. In 1E 2920, the Battlechief of Soulrest had garnered an audience with the Emperor, Reman Cyrodiil III. During the Imperial Simulacrum in the late Third Era, the city-state of Soulrest was an active settlement, being ruled by Queen Heciana. It had a rivalry with Gideon. In 3E 427, the Expeditionary Force had quelled a tribal uprising that occurred near Soulrest. Local mines and plantations were destroyed as the result. This page was last modified on 2 February 2019, at 18:10.